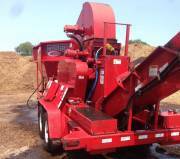 Please see our current selection of used equipment for sale listed below. Equipment often seen here includes Mulch Blowers, Excavators, Bucket Loaders, Stacking Converyors, Tree Chippers, Attachments, and more. If you have any questions regarding a listing, or would like help selecting the right machine for your operation, please take advantage of our free consultation. Used 40' Stacking/Discharge Conveyor. Electric - 220/250V powered.